A fire has ravaged an award-winning luxury resort on a private island in the Maldives. Videos from the scene show villas going up in flames as panicked residents scream in the background. No injuries or deaths have been reported. Gili Lankanfushi, a top-notch secluded resort, located a 20-minute speedboat ride away from the Male International Airport, the main international airport in the Maldives, caught fire on Wednesday around 11.00 pm. The resort said in a statement on Twitter that it is so far unclear what had triggered the blaze, adding that all its guests and staff have been evacuated from the island and provided shelter. Judging by the videos from the place, however, the luxury gateway, surrounded by pristine blue waters of a lagoon, may be completely wiped out. Gili Lankanfushi prides itself on being built “using ecofriendly materials” and “authentic style” design. 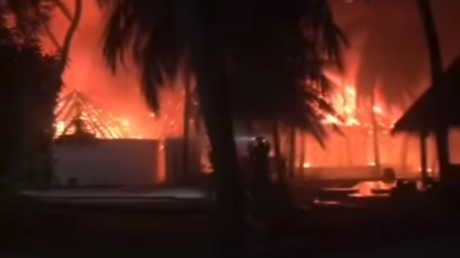 Footage filmed off the coast of the tropical resort shows its shores fully engulfed in flames. Last year, the hotel was ranked among the top five best hotels in the world by TripAdvisor, and is the No.1 hotel in Maldives.